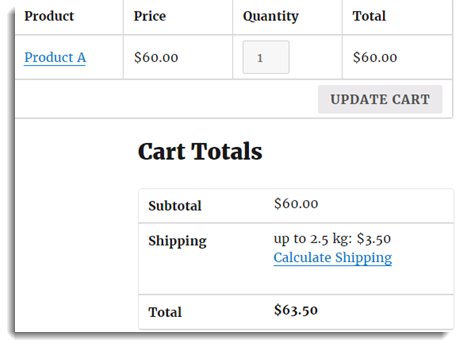 In this article, we will tell you how to configure the WooCommerce Table Rate Shipping Pro Plugin based on the weight and price of the Cart. Read below to know more about it. Total weight of the order is under 2.5 Kgs. Total Weight of the order is over 2.5 Kgs. Total Price of the Items exceeds $50. First Rule says that if the order weight is less than or equal to 2.5 kg then shipping cost is $3.5. The second rule says that if the order weight is more than 2.5 kg and less than 99 kg then the shipping cost is $5.5. The third Rule says that if the order weight is less than or equal to 99 kg and the price is more than $50 and less than or equal to $99, then shipping is free. What if the total weight of the product is under 2.5Kg and the total price is above $50? Can you guess now, between the 1st and 3rd rules, which one will be selected? The third rule will be selected because it selects the minimum cost among the multiple rules. 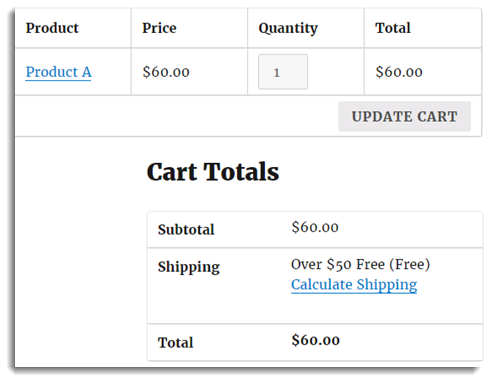 What would happen if we had selected “Per Order Max Cost:Calculate shipping cost per order Choose maximum rate in case multiple rules.”? The plugin would have chosen the 1st rule, as this is the case of maximum. Here, in this case, the cart page shows the 1st rule selected. From this, we can have a basic understanding of the relation between rules framed in Shipping Pro and the field “Calculation Mode”.